The sculptor, painter and visual artist Anish Kapoor, a British citizen of Indian origin, was born in Mumbai (Bombay) in 1954. He settled in England in 1972, completing his studies at Hornsby College of Art and Chelsea School of Art. In the early 1980s, the simple forms and bright colours of his first sculptures won him immediate recognition. Kapoor had a clear idea of his intention from the outset: to give viewers access to a “poetic existence” by eliciting in them a new way of seeing things, whether in the world around them or deep within themselves. Whence those huge concave or convex mirrors which reconstruct external reality, those mysterious cavities hollowed out of blocks of rough stone, those monumental polystyrene structures which echo the shape of our dreams, into which we can sometimes enter, there to discover strange effects of light… They are intimate, random, unforgettable experiences of which the artist wishes merely to be the mediator, without imparting any message. Now celebrated as a leading figure of contemporary art, Anish Kapoor has been awarded the most coveted prizes, including the Turner Prize in 1991. His works are on display in the world’s leading museums and in prestigious public places, such as the Rockefeller Center in New York. His Leviathan at the Grand Palais in Paris in 2011 drew thousands of visitors and he has been commissioned to design the emblematic sculpture for the London Olympic Games. 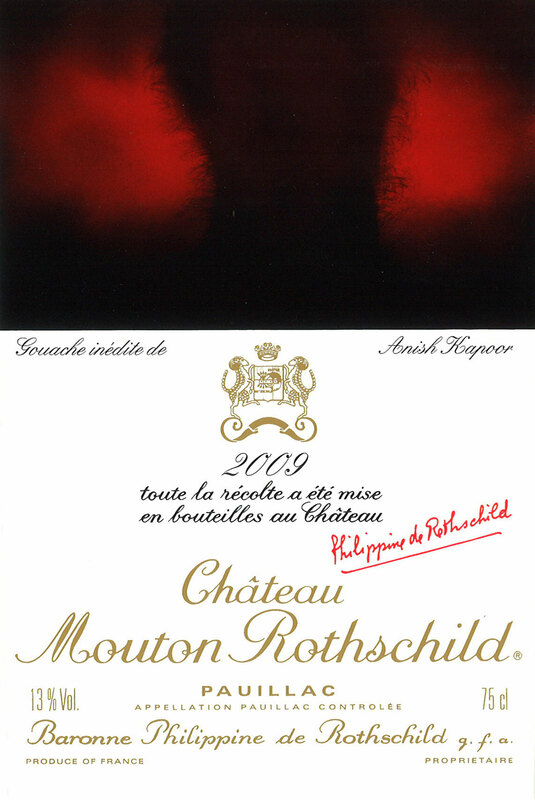 At once austere and flamboyant, the gouache he has created for Mouton Rothschild 2009 expresses the fertile thrust of plant life, the result of an intense encounter between matter and light.